As we all know that whatsapp is the most popular app in the smartphone. People are becoming so much habitual of this app that for many of them they can’t begin day without checking whatsapp first. So users want to upto date with all new things which are coming for whatsapp. This time you can set multiple profile image without crop in whatsapp. Many new features like video calling or file sharing are known to users. But do you know that you can set multiple photos as your profile picture in whatsapp. Generally, user can set single photo as profile picture, but you can set multiple photo in same image and set as profile picture. There is a very easy process of making multiple photo. For this user need to install some apps in their smartphone. In this article we will discuss how to make multiple photo in many different ways. 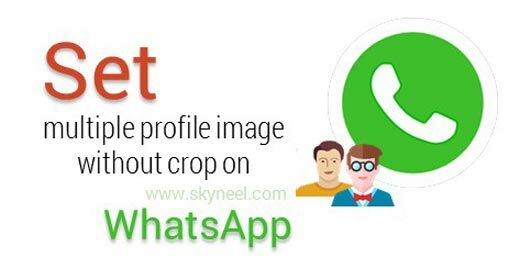 Users can create whatsapp profile photo with using free android app like “Photo Collage”, Pip Camera” etc. In these apps, multiple photo creating formats are given. In all these format the size of photos are same as whatsapp profile photo. After installing these app users have to select collage format. According how much photos user want to set in profile picture user should select format. After that select photo for each box and save it in your selected format. In these apps there are many others features also given like photo crop, color variant etc. all these photo collage size is 640×640 pixels. User can use direct this type prepared photo as profile picture. There is no need to crop in whatsapp profile image. If user know how to work on photoshop he can easily prepare profile picture for whatsapp. But there are few easy steps which help to make multiple image for those who don’t know how to work on photoshop. Make new file on photoshop whose size should be 640×640. Now drag your favorite pics in this file. Users can increase or reduced size of dragged pics by Ctrl+T and can delete section which is not useful by using Marquee tool (M). To make your photo more beautiful you can use borders or other effects. For online editing, there are many software available like Pixlr etc. although using these software you need to set canvas size as 640×640 pixels. You can use multiple photo frames also in online photo editiors. After save your prepare photo and set as whatsapp profile photo.